The event was a mix of presentations by Adobe representatives on their particular technologies and partner programs and a few presentations by “external” speakers, such as myself — and Seth Godin (!!). I’ve been a fan of Seth’s writing for years, but this was the first time I heard him speak. To hear him speak at an event called “Rise of the Marketing Technologist” and then give my presentation was kind of cool. Seth’s presentation was drawn from themes discussed in his most recent books, Linchpin and We Are All Weird. He was a firehose of insights — starting by admonishing the audience of agency executives that the advertising world as they knew it (repetitive ads on broad reach media) was dead, even if it was still walking in zombie mode at the moment. Good morning, and welcome to the end of the world! Under capitalism, real wealth has always gone to those who own the means of production. The factory worker or the coal miner never got rich, but the factory owner and the mine owner did. It was very expensive to build or buy a means of production. But today, the means of production is the laptop. It can be claimed by anyone who has the courage to decide to become an “owner” of your own production, rather than just a worker in somebody else’s machine. Finally, he said at one point, “Every time I listen to the lizard brain and do the exact opposite of what makes it feel safe and comfortable, the more remarkable I become.” And being remarkable, with your own means of production, serving unique submarkets in the Long Tail that deeply appreciate what makes you remarkable, is the key to prosperity in this new world. P.S. For some added ambiance, the event was held at the Hudson Theater on Broadway. 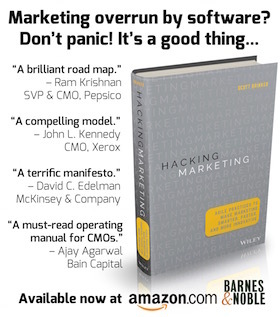 The video above never pans out, but the presentations were given on the stage — the first ever Broadway performance of The Book of Marketing Technology. 😉 The photo below is a view of the theater, where performers such as Louis Armstrong, Elvis Presley, and Barbara Streisand all appeared. Scott, great presentation; I watched it all the way through. I have a question that I didn’t see addressed in the Q&A session. Where would you put the function of Product liaison and feedback? I didn’t see it listed within your 5 missions of the marketing technologist, but it seems important. If you’re going to address the entire CX, surely the product is an important part. I’ve found in my own practice that agile marketing works best when management and the development teams are practicing lean methodologies and agile development. If I’m listening closely to the ZMOT, surely some of the “feedback” I hear needs to be addressed in the product. And quickly, not a year or more from now. Have you read Baked In by Alex Bogusky and John Winsor? Perhaps it is because most of my practice is with software startups, but I see marketers needing to integrate with and work with the product development teams as even more important than integrating with and working with IT. I’ve also seen a number of occasions when marketing contributed to the CX in ways that could have been done by the product team (examples: Flip Camera’s marketing agency created the sharing site for users to share videos; a marketing team created the wizard that read the Novell user database and populated Active Directory) Love to hear your thoughts. Thanks, Jim! Terrific point you raise. I agree 100% that product/service is at the very heart of customer experience — and in web and software companies that’s even more entwined in the digital environment than ever before. Even non-software products are increasingly including features that directly connect them with that ecosystem. But even in products/services that aren’t directly connected into the digital space, the feedback loop from customers and prospects in that “ZMOT” is invaluable. Definitely worth thinking about the right way to bring the product team into that environment jointly with marketing. I’ve not read “Baked In,” but consider it officially added to my reading list.